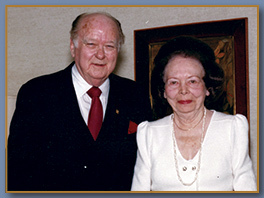 The Joseph E. and Marjorie B. Jones Foundation is a private, philanthropic institution dedicated to improving the quality of life for all people, particularly those residing in the Washington, D.C. metropolitan area, by funding human services and health care initiatives and furthering the cause of education. The Foundation was established in December 1987 by Joseph E. and Marjorie B. Jones, District of Columbia residents since the mid 1930s. Mr. and Mrs. Jones worked together to develop a successful insurance agency that served the greater Washington Metropolitan area for over 50 years. The Jones Agency grew to be one of the largest general agencies in the insurance industry with over 250 employees. Mr. Jones was well known and respected in the city’s business community and was instrumental in the development of health benefit programs for federal and armed services personnel. In 1962 Mr. and Mrs. Jones built the seven-story office building at 1666 Connecticut Avenue from which The Jones Foundation continues to operate today.